So my kids do this crazy game. They love it. They go around the house talking in robot voices saying, "What - power - do - you - want?" Then they pretend "zap" a power to the other person who has to do whatever they threw at them. It's kinda like Charades only weirder. For example they might throw "bunny power" and the person has to act like a bunny. Mmm, hmmm. No, we apparently aren't normal enough for plain 'ol charades around here. Ok, moving on. What does that weird little story have to do with today's post, fascinating as it might be? 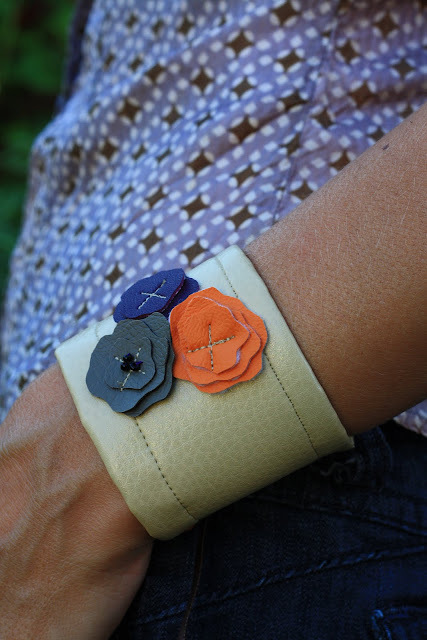 Well, I made a cute, flowered, faux leather vinyl bracelet for me and Hunter wanted me to make him something too. Being that I didn't think he would want flowers or a bracelet, I got my "Mommy Brilliant Thinking Cap" on. I made some "power" bands with the same idea in mind for the kids when they play their Power game. I did mine first to see if it would work out. I wanted my bracelet to me in a 70's cuff kind of theme. So I used charcoal, burnt orange, deep purple and beige vinyl. I think it looks pretty cute now that it's all done (Hey, I never know when I start out if my ideas are going to be a flop or a winner). So mine is in a little Flower Power theme. Hey does this cuff make my...no just kidding. I have no idea why I'm posed this way. However, my photographer (ahem, Hunter) was at derriere level. That explains it. Then I made some simpler "power bands" for throwing powers at each other. Hunter said this was his best "super power tough guy face". Ainsley didn't want lightening bolts. She wanted hearts. Apparently, hearts can be just as tough. Hey, they say the strongest power is love, right? I found vinyl at Hancock fabrics for $4 a yard on the remnant pile which started this whole hairbrained idea anyways. I bought a quarter yard in several different colors and figured a dollar a color was a pretty good bargain since I can make tons of little flowers and such out of a quarter yard. Here is a picture of what you need for my bracelet. On mine, I folded the edges over and hemmed. I didn't bother on the kids, and might not bother if I make another one since it doesn't seem to make a difference. Vinyl doesn't fray around the edges. It's all personal taste I guess. I stacked the little flower piles on top. On the grey flower, I decided to add some black seed beads. And on all of them I sewed and "x" to secure them on my sewing machine. The kids have velcro to attach theirs. I would say that is much simpler but again, I got fancy on mine and put some grommets in both ends. Then I threaded ribbon. Here was the downfall in my plan. It looks great but I need someone else now to help me put it on. Have you ever tried to tie a bow with just one hand? Dang! Should have thought that one through, genius! Oh well, I'll just wear it when someone is around to help me tie it. Clear nail polish helps keep the ends from fraying. On the kids, I just did velcro. So much easier to put on and off and it looks good too. All done! So one last time. Ta da! 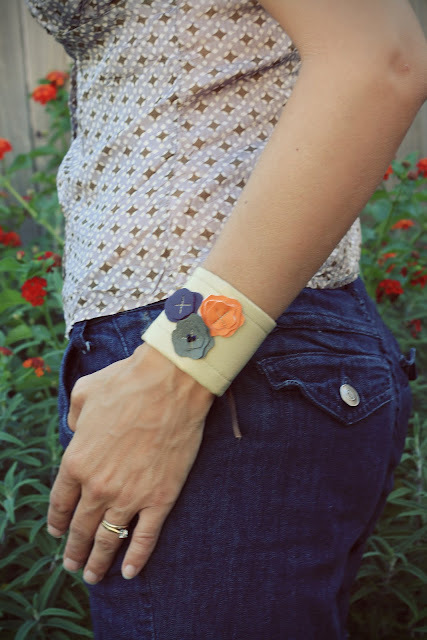 These are super easy to make and I love the cuff bracelet look. And what is going on with the massive veins in my hands? Anyone else have this problem when they hang their arms down? Sheesh! I asked Hunter what was the most powerful thing you could be. He said it was "poison bugs". I don't know how to act like that so he showed me how. It was most enlightening. So if you come over and he throws a power at you and stands there expectantly, now you know why and what to do. Those are too cute. Yours are my favorite! Hunter kind of looks like Luke Skywalker here. :) They look like they love their bracelets!